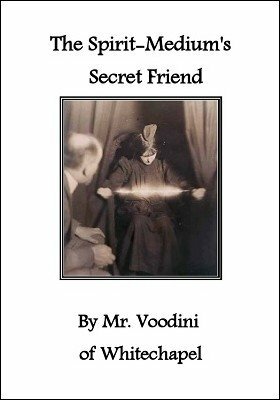 After being forgotten for a century and a half, the mythical lost text of Victorian Spiritualism 'The Spirit-Medium's Secret Friend' has finally been revealed to Paul Voodini, shown to him in dreams and meditations by his spirit guide Nero Wolfe. Really??? No, of course not. But what then is this PDF titled The Spirit-Medium's Secret Friend ? A labour of love? An intricate back-story for those with eyes to see? A plot for any number of routines? Or simply a fascinating insight into the shadowy world of the Victorian spirit-medium? You decide. Come empty handed and take from this text that which you need. The Spirit-Medium's Secret Friend is a Victorian-esque instruction manual for the developing spirit-medium that instructs the student in the ways of purity and truth. Yet it also offers a degree of more practical advice for those 'rare' occasions when the spirits may be less than forthcoming. You may call them 'tricks' or 'cheats'. The Spirit-Medium's Secret Friend would rather refer to them as methods by which the student may 'lighten the load of expectation' as they traverse the path to spirituality. An engaging, humorous, and thoroughly enthralling read. There is much here for mentalists and magicians of all persuasions to get their teeth into and enjoy.